Okay, I`m already seeing pumpkin and Fall recipes all over the blogosphere! It doesn`t even feel like Fall, yet. At least, not for me. In southern California, it`s been in the high 80s!! As much as I love Fall baking and Fall clothes, my heart is always with the Summer fruits. Especially blueberries. 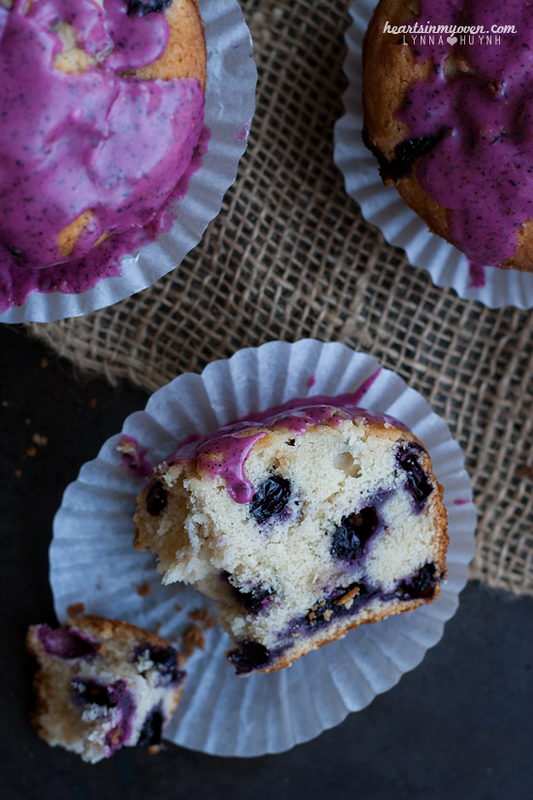 Now, blueberry muffins are nothing new. I stopped looking for new blueberry muffin recipes, since I just sworn by this brown butter double blueberry muffin recipe. Those muffins are always popular wherever I bring them. However, I think it just met its match with this recipe right now. Oh my, my, myyyy. I swear, you must try this recipe. I think I might have to reconsider which one is my favorite blueberry muffin recipe now! As a result of the cake flour, these had a texture of a cake more than a muffin. They were soft and crumbly like muffins, but not as light? I blog about food, but I`m terrible at describing... Haha. Regardless, these were some of the most amazing blueberry muffins I`ve ever had. And, it`s not just me. My dad had a bite the night I made them and he loved it so much, he even woke up my sleeping mom to tell her how good it was. My dad doesn`t often compliment my baked goods, since most Western sweets are too sweet for his taste. However, he came into my room and told me to save this recipe because he wants it. It was THAT good, people. My sisters who came home for a holiday thought they were excellent as well! And who doesn`t love glaze? 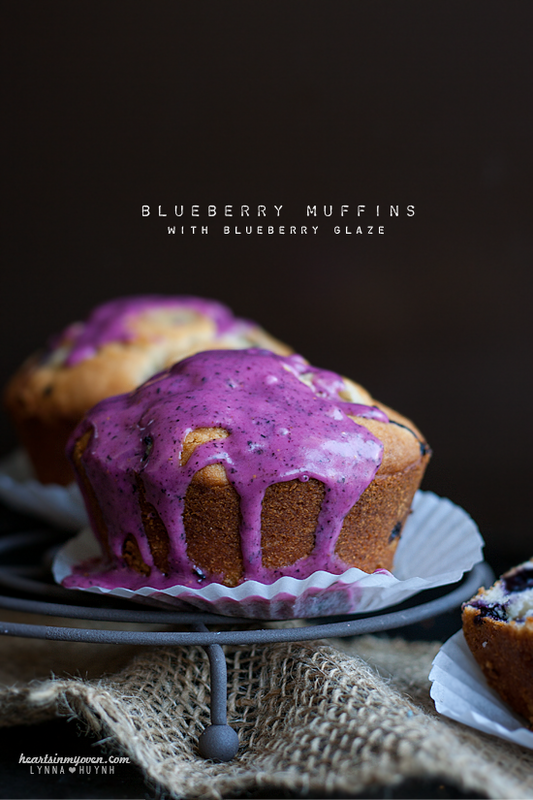 This blueberry glaze was just the perfect addition to the muffins. It also had this gorgeous color to it from the fresh blueberries. Since Summer`s not over yet, I highly recommend you to utilize those fresh, sweet blueberries before Fall comes and pumpkinified everything! :) Just a friendly reminder...this is a MUST MAKE! Must!! I made these muffins in a Texas size, so they were pretty big. I got 5, but you`ll probably get around a dozen if you made them in the standard size muffin pans. 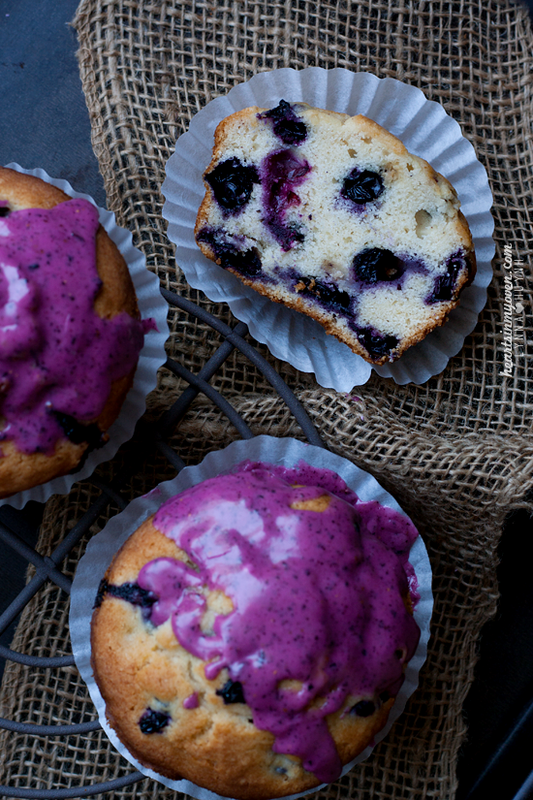 However, the larger the muffins, the more plump blueberries you can squeeze in one muffin! If you have a larger size muffin pan, definitely sure that. 1. Preheat oven to 375°F. Line muffin pan with liners, or grease well (butter/oil). 2. In a medium bowl, whisk together flour, baking powder, cinnamon, and salt well. Set aside. 3. In a bowl with an electric mixer, beat together butter, sugar, and brown sugar until light and fluffy (at least 3 minutes). 4. Mix in the egg and vanilla extract. 5. Toss blueberries in your about ¼ cup of the flour mixture. 6. Fold in the rest of 1/3 of flour mixture in with the wet ingredients (butter, eggs, etc). Add half of the milk and mix. Alternate between flour and milk and mix until just combined. 8. Using a cookie scoop, divide the batter between the muffin cups. 9. Bake for about 25-30 minutes, rotating pan 180 degrees halfway through baking time. 10. Allow muffins to cool in pan for 5-10 minutes, before removing to cool completely on a cooling rack. 11. In a food processor, blend together the blueberries and powdered sugar until combine. - I baked them for 28 minutes, left them in turned off oven for about 5 more minutes. - I baked in Texas size muffin pan, but if you`re baking in a smaller size, reduce the time.